It's a bit sad that the label info has to describe High On Fire's third album as a Motörhead meets Slayer band, as vocalist, guitarist and band leader Matt Pike used to play with the legendary doom metal band Sleep that was at the vanguard when doom metal had its second spring time in the early Nineties. If you always enjoyed the slow of lava sound of those bands, you might have to listen in first with High On Fire, as this is a certain deviation from their roots. Blessed Black Wings is absolutely no high speed album, and about half of the songs oscillate around the seven minute mark, but the slow and tense rhythms of doom have been replaced by a much more rocking attitude: Matt Pike's guitar is so heavy that you have a hard time believing this is just one guy playing, and the rhythm section takes well care that the song is backed by a solid fundament, in a way that you have to admit that these guys are bringing back the power into the expression power trio. And while there are not that many variations on the album, you can divide the songs into two categories: the long mid-tempo songs like the title track, The Face Of Oblivion, To Cross The Bridge and the instrumental closer Sons Of Thunder that show High On Fire from their most threatening side, and the comparatively shorter songs that are brimmed with evilly distorted guitars and a generally faster pace, where especially the more primeval than primitive Anointing Of Seer prevails with an unharnessed energy that is typical of mid-Eighties proto-thrash metal. 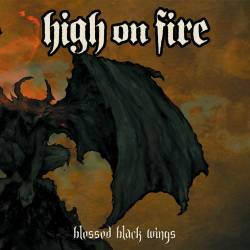 Blessed Black Wings could have done with more subtleties (like the latest release from Alabama Thunderpussy), but then it is still an amazing album proving that you can have powerful guitar music (and I would consider Matt Pike a guitar hero, albeit a very unpolished one) and mostly simple tunes, working together as an immensely fierce mixture. Early thrash fans, post-doomsters, trans-stoners and whoever likes simple yet aggressive heavy metal music should check this band out.